The Other Person (Part II) - A Hungarian Film By Ferenc Kosa is an event that took place between 30-Apr-2004 and 26-Apr-2006 in Hyderabad. Are there any heroes at all? The second part of the film takes place in the tragic fall of 1956. Antal Bojtar Jr. is appointed a member of the revolutionary committee at the university. He does not accept the honor, however, and speaks up against violence in the spirit of his father's will. The mother, who is worried about her son's life, sends her father to bring the boy back from Budapest. The young man will not listen to the words of caution because he feels that he must complete another task. With his friends, he initiates a strange and difficult investigation to discover the identities of those narrow-minded murderers who killed his love, a medical student. The grandfather can only bring back Antal's dead body, to bury him in secret, in an unmarked grave. The Other Person (Part II) will be screened at Sri Sarathi Studios, on the 30th of April, at 7pm. The film is directed by Ferenc Kosa. The cast includes Ferenc Bessenyei, Csaba Jakab, Anna Rackevei, Zoltan Varga and Zsolt Szerenyi. Please contact Prakash Reddy of Hyderabad Film Club at 2373-0841/93910-20243 for further details. 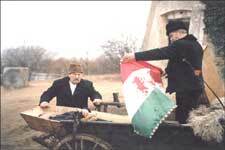 Be the first to comment on The Other Person (Part II) - A Hungarian Film By Ferenc Kosa! Just use the simple form below. fullhyd.com has 700,000+ monthly visits. Tell Hyderabad what you feel about The Other Person (Part II) - A Hungarian Film By Ferenc Kosa!